Pretty Raena was rescued at "the JFZ" or junk food zone - a cluster of fast food restaurants along a major highway. It was a maliciously cold night; freezing temperatures & an icy mean wind. We had modest success at an other colony we're working on so we stopped at the JFZ to try our luck. We didn't see any cats but as we were getting ready to leave, we encountered 2 women trying to coax a little calico into a carrier, out in the bitter cold. We explained we were a rescue group & we could help. We set our humane traps & poor hungry cold Raena went into the trap right away. After she thawed out a bit it was evident she had an injured rear foot. Turns out this little cutie is quite a friendly girl! Her foster mom reports she LOVES to be petted. "She has made my 2nd sink in the master bath her "watering hole". If I'm in the bathroom, she's up drinking the water I put in the sink. She eats really well. 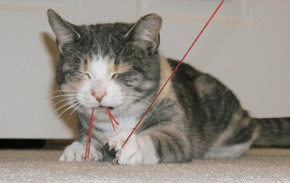 She likes playing with string or string-like toys, like the wand toys. She liked the laser, too." 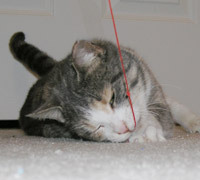 Raena has been to the vet & is spayed, up-to-date on vaccines & tested negative for FIV & F-Leuk. Her foot has healed up fine. She was estimated by the vet to be around 2 years old. 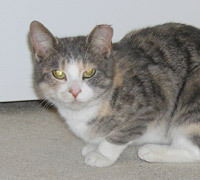 Raena would do best in a home without other cats or dogs. Personality, glamour, companionship - what else could you ask for in a friend?